In the West, precious gems such as diamonds or rubies represent the highest ranking status symbols. However, in China, it is Jade that has been a symbol of status, spirituality, purity, and health for over 9,000 years. The value Chinese culture places on jade cannot be understated. Respect for this stone has been seen throughout history and remains prized to this day for its durability, purity, color, hardness, and most of all, for its beauty and powers. Mined and worked in China since the Stone Age, Jade has been crafted into a wide assortment of applications. It has been formed into beads, jewelry decorations, artwork, statues, musical instruments, furnishings, healing talismans as well as tools and weapons for battle. Archaeological mining has even discovered wealthy members of society entombed in Jade Suits. These unique suits were made of sheets of jade sewn together with gold wire or silk thread, forever showcasing the status of the buried. In addition to being a status symbol and a material formed into coveted items throughout history, Jade is revered for its many physical and spiritual healing properties. The belief that jade possesses healing powers has survived through generations and it is this belief that attracts many towards it. Jade is most well known for its magnificent light green color, however, this stone can be found in varying shades of black, blue, purple, red, brown, yellow or white. Each color of jade is believed to bring diverse healing, meaning, and power but the stone’s central meaning is said to be rooted in calm wisdom, healing and protection, ultimately blessing whatever it touches. Read on to discover jade fun facts, why jade has been a beauty and wellness staple for centuries and what you might expect if you incorporate jade into your home care rituals. Surprisingly, Jade is a mineral rock name that is shared by two different silicates – Nephrite and Jadeite. What we call Jade is not a single polished and cut crystal, such as in the case of diamonds or rubies— it is a stone made up of one of these mineral combinations and formed from interlocking micro-crystals. Though they are both referred to as Jade, they have some distinctions. Nephrite Jade was the first Jade discovered in China. This form was used and carved since ancient times and became known as traditional jade. Nephrite has been mined so thoroughly overtime that the original deposits in China are now all but depleted. Jadeite Jade is denser and easier to work with making it the form more recently preferred by Chinese artisans and prized by the Chinese people. It is hard and lustrous, rarer than Nephrite, and usually more expensive. Though they have different compositions, hardnesses, densities and crystal structures, both are exceptionally tough stones, similar in appearance, and equally valuable in metaphysical properties. Both occur in the beautiful green shades we've come to recognize as jade and no matter the mineral composition, it is a prized and respected stone. Jade has been sourced from around the world. During prehistoric times, the key known sources of Jade were found in China, India, and Korea. To date, this prized mineral has also been found in Canada, Maori (New Zealand), Mesoamerica (Guatemala) and even though archaeologists have discovered found jade all across Southeast Asia, today, upwards of 70% of the worlds Jade is sourced from Burma. Jade has been formed into tools for the skin for centuries. Gua Sha and Jade Roller tools are both carved from jade and used to help boost vitality and beautify the look of skin. Jade has been formed into tools for the skin for centuries. Gua Sha and Jade Roller tools are both carved from jade and used to help boost vitality and beautify the look of skin. Through unique movements connected to these tools, you can soothe and detoxify skin, reduce the appearance of inflammation/puffiness, help to refine pores, and alleviate other signs of aging. These effects combined with the healing properties of the jade stone can lead to a clearer, firmer, smoother complexion. Beautiful, luxurious tools that make us feel better and look younger, who doesn’t want that? With the resurgence of Jade as a coveted stone for its beauty and healing properties, the availability of Jade has appeared to double overnight. If you look, you can find an abundance of jade on Amazon and other online sources. Numerous physical objects and skin tools are now being advertised as made of Jade and sold over the internet for enticingly low prices. not all of these are jade! However, not all stones that are sold as jade are real jade. Sadly, to capitalize on the demand for this precious stone many factories have mass produced colored glass to look like jade and other manufacturers have mastered the art of replicating jade by dying and chemically treating other types of stone like marble, serpentine, aventurine and quartz. In order to access the suggested healing benefits of jade, you need to acquire the real stone with mineral content mirroring Nephrite or Jadeite jade. So, if it’s made of Australian jade, Malaysian jade, or mountain jade, it’s fake and won't give you the benefits you seek. There are only 2 types of jade: jadeite and nephrite. To increase your chances of purchasing an authentic jade, seek a source that certifies the jade as Type A, documents treating the jade stone in natural plum juice (not harsh chemical treatments) and only uses natural wax, like beeswax, to polish the stone. Jade is a beautiful stone with a long historical reign as a healing tool. It has stood the test of time and is still valued for a magnitude of benefits. 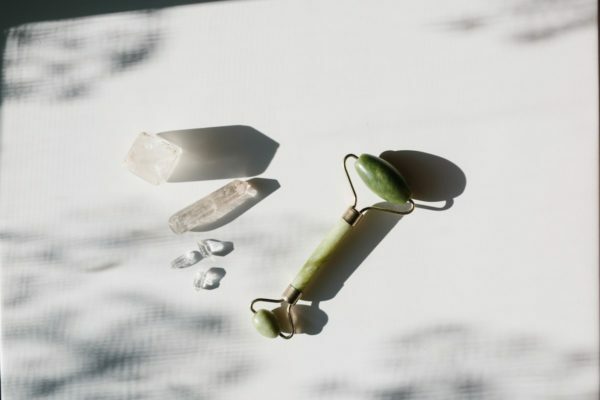 Most recently this mineral has resurfaced in the form of popular skin healing tools, the gua sha and jade roller. Its only challenge is identifying fake duplicates flooding the market. Like cubic zirconium diamonds, fake jade may look pretty and can meet your basic needs, but to gain access to the innate healing abilities of this mineral stone, I suggest you spend some time to find a quality source you trust then rest easy knowing you're treating your skin well from the outside in. How do you use jade? Let us know in the comments below.